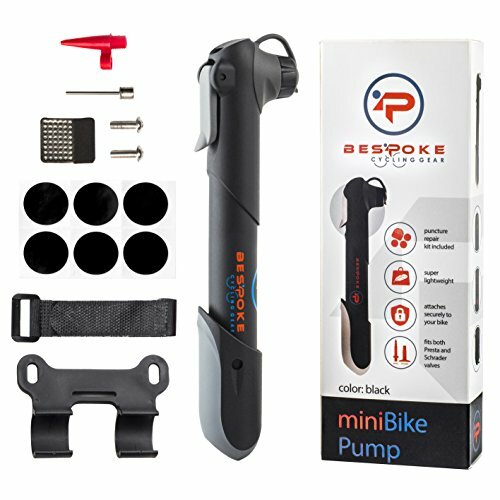 BeSpoke Cycling Gear Mini Bike Pump & tire repair kit - dual nozzle fits Presta & Schrader valves - compact & lightweight - frame-mounted bracket - pumps road, mountain, dirt & BMX bicycle tire tubes by BeSpoke Cycling Gear at Melon City Bike Club. MPN: IQ309. Hurry! Limited time offer. Offer valid only while supplies last. WHY CHOOSE OUR MINI BIKE PUMP? Like you, we love bikes. We know what spoils a perfectly good ride other than an involuntary dismount - a flat! WHY CHOOSE OUR MINI BIKE PUMP? Like you, we love bikes. We know what spoils a perfectly good ride other than an involuntary dismount - a flat! Punctures happen, be prepared. We want you to spend your precious leisure time in the saddle, not on the side of the road. As your first line inflation device, or the perfect backup to your CO2 canister, our pump will get you back on the bike fast! Our pump is compact and super lightweight. Not much bigger than the palm of your hand, you can easily stuff it in your jersey pocket, or store it in the supplied frame mount which attaches under your drink bottle cage. A pump for all bikes - regardless of your riding style, our pump will save your day. Our pump is compatible with Presta AND Schrader valves, and will inflate tires for your road bike, mountain bike, BMX; and it will even inflate the tires on your kids bikes. Our pump is functional and feels good to use. A quality non-slip ergonomic handle, solid nozzle which clips firmly into place, and secure dust cap to keep the inflation nozzle grit and grime free, our pump is a pleasure to use and is not going to cramp your style. In the box alongside the pump and mounting bracket, we provide 5 tube repair patches which are super easy to use - stick on and forget - no glue required. We also throw in a ball inflation needle.  GET BACK ON THE SADDLE FAST - apply a glueless repair patch (included), clip on the pump nozzle and inflate your tire to your desired pressure (up to 120 PSI.) SUPER EASY, NO FUSS, you'll be back on your bike in no time.  ONE PUMP FOR ALL BIKES! - Our pump fits both Presta (French) and Schrader (American) valves. Road bikes, Mountain bikes, BMX, kids bikes - we inflate them all! ONE PUMP FOR ALL RIDEKIND!  RIDE LIKE THE WIND! - Smaller than the palm of your hand, and under 3 ounces - this portable pump is practically weightless! It can fit into your pocket, saddle bag or attach it to your bike frame with the supplied bracket.  BE YOUR OWN PIT CREW! - Blow a tire? SO WHAT? Our mini pump is the perfect back up for your CO2 inflator, you will never be left stranded by the side of the road. CYCLIST'S GUARANTEE - we personally design and road test our products - whether its a lazy Sunday pedal, or you are climbing a peak, this pump will save your ride or your valuable CASH BACK! If you have any questions about this product by BeSpoke Cycling Gear, contact us by completing and submitting the form below. If you are looking for a specif part number, please include it with your message.